In a munching, slashing, biting and clawing month-long Friday night movie-marathon, on every Fridays at 21:00 from 6 July, Horror Channel traverses the four cornerstones of terror – Vampires, Werewolves, Zombies and the Slasher film – to deliver 16 films that celebrate the progression of the most popular horror genres entitled the Evilution of Horror. First up on Friday 6th July is a foray into Vampire lore, kicking off with Hammer’s 70s’ classic SCARS OF DRACULA (21:00). The quadruple bill then jumps forward to 1987 for RETURN TO SALEMS LOT (22:55) before bringing us up to date with the LIFE BLOOD (00:50)– a Sapphic gem that sees two seductive predators given the gift of vampirism to rid the world of bad blood. The night concludes with UMBRAGE: THE FIRST VAMPIRE (02:25) starring Doug Bradley – where blood sucking biblical mythology meets the Wild West. Next up, on Friday 13th July is Slashers Night, and the stalking starts with FRIGHT (21:00) starring Honor Blackman, Susan George and Dennis Waterman in a classic tale of babysitting hell. This night of slice and dice continues with BLACK CHRISTMAS (22.55) – the film said to have inspire the Scream franchise. Evilution of Horror continues on Friday 20th July and first up is one of the best Werewolf movies ever made – the 1981 classic AN AMERICAN WEREWOLF IN LONDON (21:00). The 80’s was a great time for the lycanthrope as our next film, Neil Jordan’s 1984 slice of movie magic – THE COMPANY OF WOLVES (22:55), proves. Then jumping two decades we come to the beautifully gothic ROMASANTA: THE WEREWOLF HUNT (00:45), starring Julian Sands. The night culminates with a film that takes us up to the modern day with 13 HOURS (02:40) starring Gemma Atkinson and Harry Potter’s Tom Felton. Finally, on Friday 27th July we turn our eyes to the Zombie movie, which shuffles into view with the film that has the accolade of being the first ever zombie flick – George Romero’s 1968 classic NIGHT OF THE LIVING DEAD (21:00) , A quick leap forward brings us to 1980 for Lucio Fulci’s classic CITY OF THE DEAD (22:55), famed for the director’s trademark non- stop close ups. Next up is the 2006 cult-hit THE ZOMBIE DIARIES (00:45) which introduced a found footage theme. 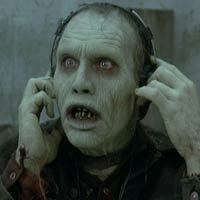 Rounding up this Frightful Friday comes APOCALYPSE OF THE DEAD (02:20) – in which the zombies find their running shoes!